Call 1-855-643-8473 for a dealer near you. Watch the video it shows just how durable these tires are. We also offer Military discounts with ID. FREE shipping on all sizes in the continental U.S.
Run flats are available in all these sizes 25x8x12, 25x10x12, 26x9x12, 26x11x12, 26x10x12, 27x9x14, 27x11x14, 26x9x14, 26x11x14 That’s awesome. Utv tires at the lowest prices I have seen. Thank you guys we received all 80 Run Flat tires and have them mounted on our fleet of 20 John Deere Gators and have not had a flat issue at all. We get so much more work done in a day now not having to deal with flats. 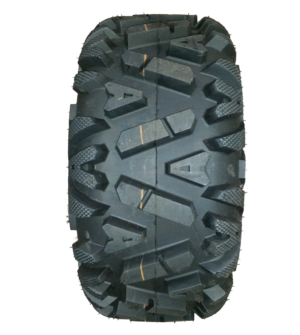 These truly are the best Utv tire in the Market and I have recommended them to several others. Got mine in the other day and have to say these are one tuff tire. 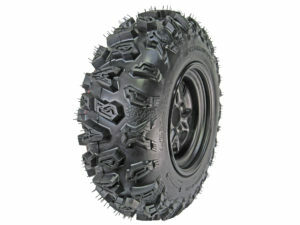 Not your average Utv Tire that’s for sure. If you are wanting something that you don’t want to have to deal with any flats this is the tire for you. I can see were fleets and large companies would want to have these installed. No BS with these tires. In my research on these tyres I have not read anything on the maintenance of these tyres, ie. when the tyre does get a puncture does it get plugged or not. Could someone advise? 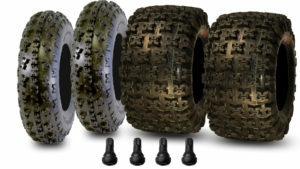 In a rare occasion that you were to get a puncture on a Run Flat tire, you can’t tell a difference if it had air or not, all of our testing is done with the U.S. Military, the Run Flat was designed to Run without virtually any air at all to help our soldiers get out of any enemy fire they would come across, you can feel confident you will not be left stranded anywhere, you can go for about an extra 40 miles if the tires had punctures and no air, so no you do not need any slime or plugs for our (A-033) Run Flats, it is a true Radial Constructed 12 ply Run flat tire, please give us a call at 855-643-8473 so we may help you better. Further to my post above dated 13 January 2015. 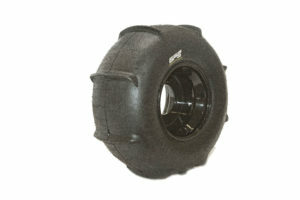 I purchased online 4 x Sun F 12 ply tyres for my ATV. What has been supplied are 4 x Sun Viper tyres. Cast into the sidewalls of these tyres it reads 6 Ply whilst in the coloured Viper emblem is 12 ply and separate from these printed in white ink is “12 ply”, it all a bit confusing. So have I been conned? What ply rated tyre have I been supplied? Can you please advise/clarify? We are not familiar with the brand Viper or the name Viper on a tire, so you might want to contact your local dealer you purchased this at. SunF is known to private label for many companies however we are not familiar with the name Viper. Further to my post above dated 13 January 2015. I did an online purchased (not from yourselves) for four Sun F 12 ply tyres. I have now recieved these tyres but I am confused as cast into the sidewall placard it reads 6 ply rating, the tyres also have a coloured logo with the word Viper and 12 ply. There is also no mention of “A-033”. Are you able to clarify what ply rated tyres I have recieved? Have I been conned? Question for you guys How do I become a distributor of your products. We tested these GPS XII tires and found them to work perfect for what our customers are in need of. We have over 600 dealers we sell to and would like to carry these tires. 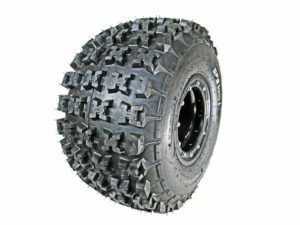 Please e mail and let me know how we can get set up to sell these GPS XII Run Flat Atv/Utv Tires. Thanks guys for recommending the RP Run Flat they have been bullet proof. Hello, I have a question we purchased a set of your RP branded run flats and found that they out lasted the set of DWT moapa tires we got a few months back. It’s obvious the rubber is different between the two and we want another set of RP but did not see the size we need. Any chance of getting other sizes in the RP tire brand. 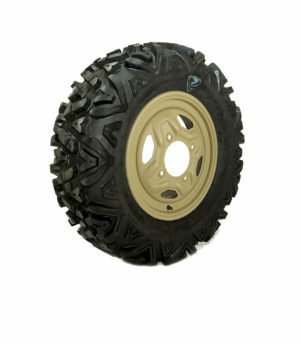 Very nice tire, We installed a set on or Polaris ranger and have to say they are the best tire we have ever purchased. This tires are absolutely what they say they are. We have a fleet of John Deere 825i gators and the original tires were shredded in a matter of 2 weeks. After searching and finding nothing but great reviews we decided to spend the money and boy are they worth it. Will be ordering another set soon to mount on another 825i. Indestructable tires! I have a set of these and have done around 1000km over the harshest desert conditions you can imagine, shark rocks, sharp tree stumps, deep mud, you name it. These things are in a entirely different class of tire. I have run my tires at ZERO PSI for the whole time, yes that right ZERO… The side wall on these tires are so strong that the do not even need bead lock rims, they are so tough that they force themself in place on a standard rim. I have a Yamaha Grizzly quad fully loaded up with gear and a 130kg rider and the tires barely deform under the weight with the air valves removed. Perfect tire for desert/ remote exporation. I have had 1 sharp stick puncture the tire (not an easy task) about 300km’s ago and I pulled it out and kept riding without any deformation. I still have not even plugged the hole and have done 300km since….zero deformation to tire. Thank you guys these are the best tires i have ever purchased. Tires are a bit heavier than i was hoping but we have put these through the test here in Texas and they have our approval. We tried several other brands and nothing worked like they claimed but these Spartans are truly the best tire we have ever used. Have had them now for a little over three months and not an issue one and with any other tire we would have had several flats for sure. All i can say is WOW! these are crazy strong. Everything about the purchase was great the sales guy was very knowledgeable, the packaging of the tires was the best i have ever seen for a tire and the shipping was fast. Highly recommended. Just received my Run Flat tires a few days ago and have made a few rides with them and so far no flats or issues, they seem to handle very well and very little difference in ride quality if any. You can tell these things are very durable as soon as you feel the tire. Nothing else like them that i have ever seen.